Origin have recently been featured on the BBC Radio 4 programme PM, where Managing Director, Andrew Halsall, discussed Origin’s continued success with Business Correspondent, Jonty Bloom. Introducing a section on business investment, presenter, Eddie Mair, comments on how business lending by banks is falling dramatically and that because of this, businesses may choose to invest their own savings and cash flow in their business instead. In an interview at Origin’s headquarters, Jonty and Andrew discuss how Origin are expanding without the help of investment from banks, and are continuing to grow the business successfully. Jonty Bloom: Origin Frames in High Wycombe make those trendy, folding doors for home extensions, letting you bring the garden into the house. Now they’re expanding into making windows which, as Managing Director, Andrew Halsall, told me, means investing in new machinery. Andrew Hallsall: These are the machines we’ve just bought - the CNC machine, the saw and crimping machine, all to start the windows and this was about a £250,000 investment. Jonty Bloom: And when are you starting production? Andrew Hallsall: We’ve just started. We started about three weeks ago, we’re making the odd one or two at the moment but it’s going up and up every day. Hopefully, we’ll get up to a thousand frames a week within 6 months. Jonty Bloom: That isn’t the only investment the company is making. Expansion means it needs lots of new kit and the tax breaks announced by the Chancellor are making a big difference. Andrew Hallsall: At the moment, we have no borrowing in the company, so we fund it all from within the business from cash flow, so the changes in the tax have been extremely beneficial for us. We’ve increased the space, we’ve increased the number of machines we’ve got, we’ve been able to expand and bought new vans. Jonty Bloom: Those tax breaks mean that any company can invest up to half a million pounds and claim the money back against its tax bill. Who wouldn’t want to invest in future profits rather than give the money to the tax man? Jonty goes on to discuss how, as a country, the UK doesn’t invest as much as we should in business, but how successful companies like Origin can continue to expand regardless of this. Jonty Bloom: And how many people do you employ? Andrew Hallsall: At the moment, across the whole of the organisation, it’s about 105 but that’s increasing rapidly. At the beginning of last year, it was probably 70 and at the end of this year, it will probably be about 140 to 150. Jonty Bloom: If you could replicate that across the whole economy, our problems would be over. 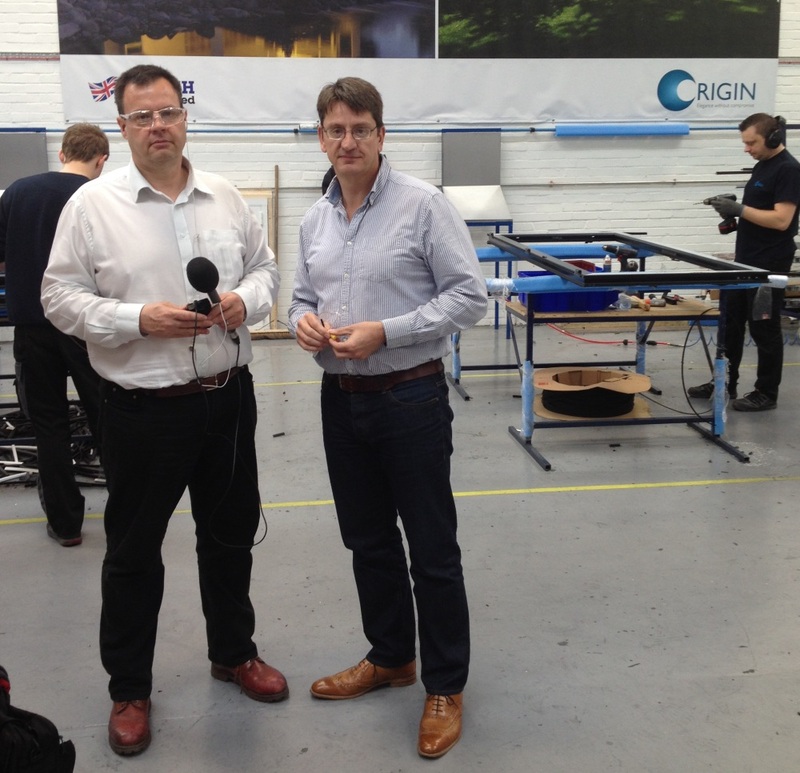 Thank you to BBC Radio 4 for visiting Origin HQ! For more information on window frames from Origin, please contact us.